Notice all the “Faces of Penn State” posters popping up everywhere on campus? They’re pretty hard to miss but if you did, they hang from bulletin boards in buildings and residence halls and even hang from the lamp posts on College Avenue. 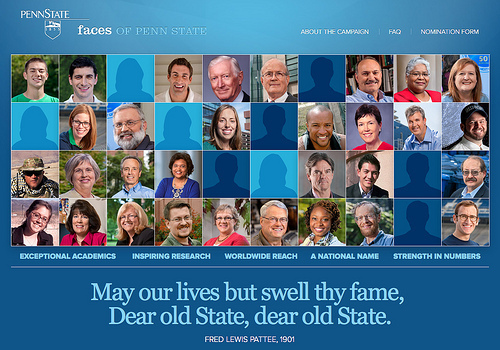 They show the beautifully smiling faces of some of Penn State’s students, professors, alumni, faculty and staff. These faces have made some great accomplishments and Penn State is proud to showcase them. Now what does this have to do with Public Relations? “Faces of Penn State” is Penn State’s new and on-going PR campaign geared towards rebuilding our reputation from the thrashing it suffered during the Jerry Sandusky scandal. The campaign is the work of Edelman, the world’s largest public relations firm and whom Penn State hired back in April to help restore our great reputation. It highlights the extraordinary accomplishments and contributions to others of those in the Penn State community. Faces share their stories of accomplishments and there is also a way to nominate new faces on the website. This was a great way to shine some positive light on the people who truly make this university what it is. Celebrating and honoring them in this way shows Penn State pride and shows outsiders we are more than one man and his wrong doings. Check out the campaign website faces.psu.edu. It’s a great way to see and celebrate the greatness our fellow Penn Staters are achieving. ← Do You Get Your News From Twitter?